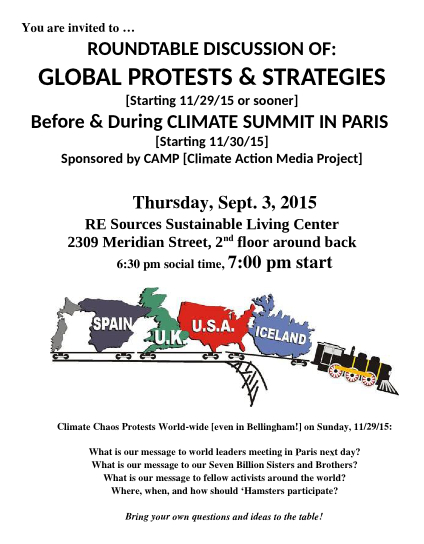 Attached file includes the flier for the special roundtable sponsored by CAMP and open to all climate warriors and all groups in Blockadia [from Portland to Vancouver, BC, directly or indirectly confronting the challenges climate chaos poses to our continued existence. The agenda for the roundtable is pretty sketchy right now, open to your input, suggestions, and questions. If you think of something at the last minute be sure to say so at the beginning of the meeting. Even if you cannot attend, feel free to call or e-mail your feedback so others can address your concerns. The roundtable should include groups whose main missions include peace, justice, democratizing local, state, and/or federal government[s], economic collapse, environmental degradation, etc. The main focus of the meeting will be time and location. All of you reading this have already been engaged in the struggles listed above for many years and will still be engaged in those struggles for the rest of your lives. And you can already see the connections with climate chaos. So please spread the word, using the attached flier/poster wherever you can. If you weren’t already planning to go TONIGHT, August 24th, 6:30 pm, RE Sources Sustainable Living Center, 2309 Meridian Street, RE Sources, Community to Community Development, and Familias Unidas por la Justicia will co-host a forum event to examine some of the immediate impacts of climate change, industrialized agriculture, and fossil fuels. Printable flier for the Roundtable is here. Feel free to post. This entry was posted in Announcement, Commentary, Event, Information and tagged Blockadia, CAMP, Climate Action Media Project, Climate Change, Climate Summit in Paris 2015. Bookmark the permalink.